Scones! In all their misshapen, bulging glory. Well, pumpkin season is winding down – but what a long, crazy ride Trader Joe’s has given us this year. You never can guess what perfectly fine product TJ will suddenly feel compelled to put pumpkin in, but it will always be surprising. 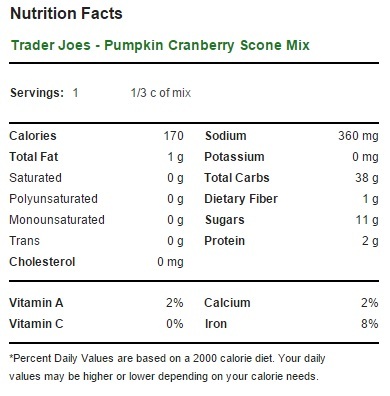 Case in point, Trader Joe’s Pumpkin Cranberry Scones. Cranberry scones? Sure, no one’s going to bat an eye at that. So why go the extra step and put pumpkin in it then? That’s a question that only Trader Joe himself can answer, but the strong money is on some sort of highly localized brain aneurysm. Do you? Or do you enjoy clotted cream and jam? In the same way that tortilla chips are mainly just a delivery system for delicious dips, the value of a scone is in it’s ability to convey sweet and fatty condiments from the jar to your mouth. The scone is, I think we can admit, no one’s first choice of pastry. Combining a not-actually-sweet blandness with a touch of salt, then serving it in irregular, dense patties might show a certain ingenuity of baking but it isn’t likely to eclipse the croissant – or even the English muffin – anytime soon. And yet… and yet… I find myself enjoying these scones. Unlike most scones I’ve had in my life, they’re not too dense to enjoy. They actually have an almost biscuit like fluffiness to them, especially straight from the oven. And while these scones still aren’t sweet, they do feature enough moments of sweetness to make them enjoyable to munch on, even without copious amounts of heavy cream. These moments of sweetness are thanks, primarily, to the scattering of dried cranberries that speckle the batter – generous enough to dress up every bite, but not so many that they undermine the sconeiness of the scone. Presumably the pumpkin that was included in this dish was put there for the same reason, however despite top billing in the product title, it doesn’t make much of an appearance. In fact, the pumpkin levels in these scones are sub Pumpkin Cornbread, as the scones don’t even smell that strongly of pumpkin or pumpkin spices even straight from the oven. I guess that undermines the whole point of putting pumpkins in them in the first place – but I really can’t get too mad over that. Whatever Trader Joe’s is doing with scones is working, and if that means they feel compelled to put low levels of pumpkin in them I’m willing to sign off on it. Cooking the scones is one thing – but eating them is another. Even if these scones are edible on their own, even if technically you don’t have to slather them with jams and marmalades and butter and curds, you might as well anyway. These are scones after all – that’s most of the fun. If you want to shake up the scone scene a little bit, you can try a few of the scone related recipes TJ recommends. These include hitting them with cream cheese, or slicing them in half and popping in a scoop of ice cream. In both cases you could use Trader Joe’s Pumpkin Cream Cheese, or Trader Joe’s Pumpkin Ice Cream to really up the pumpkin ante. Other suggestions that worked well for me were Trader Joe’s Pumpkin Butter (which really stood out as delicious), Trader Joe’s new Cranberry Apple Butter, and even Trader Joe’s decadent Pumpkin Caramel Sauce. Really, with the biscuit like fluffiness and mild sweetness of these scones, you can’t go that far wrong. Would I Recommend Them: Yes, these were some fine scones. 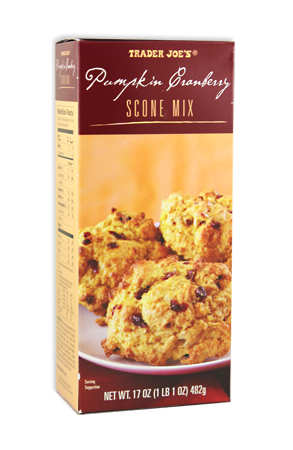 Would I Buy Them Again: Still not a big scone fan, but I’d consider it. Final Synopsis: Semi-sweet, not-too-dense scones with plenty of character but not much pumpkin.